I started doing some writing this week on a book I'm calling The Seeker's Guide to the Spiritual Path. And it was a truly mystical experience. I was writing the story of how I started on my spiritual path and all the influences that shaped my beliefs. I've told short versions before, centered around how I learned about forgiveness and set out on my spiritual journey in the wake of my father's death. The story I've never told before was the FULL story that includes a tiny red book my mother kept in her bedside table. Neither of my parents were religious and, if it weren't for this red book, I would claim neither were spiritual, also. But my mother would frequently pull this book out and read it. It seemed to bring her comfort. At first I thought it was a book of love poems and thought it was odd my mother would refer to it over and over again throughout the years. 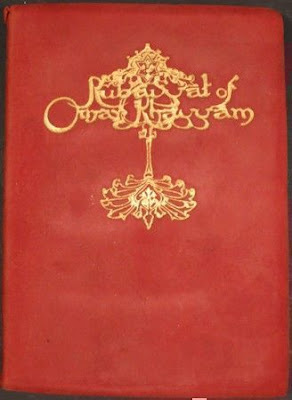 But what I didn't realize until after she was gone was that the Rubaiyat by Omar Khayyam was a book of devotional poems written about the Divine. I was too young and atheistic and, frankly, heartbroken at the time she died to care too much about that little red book. But when I look back over my life, I see that I was always curious about it, just not curious enough. That is, not until I really started on my own spiritual journey. So, I was writing about all of this and got very emotional because I felt my mother all around me. I heard her in my ear and felt her in my fingers as I tapped the story out. My mother died when I was 21, so I'll never really know her relationship to that book, but I always thought it was like a Bible to her. And while she would quote from it from time to time, I suspect her relation to those words was something she kept private, as we all do with our most intimate and personal thoughts. Part of why I got emotional is because it has been rare in the past 32 years to feel my mother around me. And there have been times I have desperately needed her. Even when I dream about her, I dream about her not communicating with me! It makes no sense because I felt she and I had a deep soul bond in life. We locked horns many times, but underneath we both understood it was because we were too much alike. As she was dying, we were very close. There were times I was the only one allowed to touch her and care for her. I felt there was a deep understanding between us about a lot of things. I thought if she were to come back to anyone, it would be me, if for no other reason than that, with my psychic capabilities, I'd be the easiest to connect to. So I have felt hurt and been puzzled over this for years. I told myself it's because she and I have no unfinished business. My father and I had a lot of unfinished business and he came around A LOT during certain times of my life. OK. So. Wow. First, it speaks to the role of a spiritual teacher, walking the talk. And the transcendence that can come from that practice. But then it also speaks to the seed planted within me by my mother's deep connection to the book at her bedside, kind of like she had passed the baton to me. Of all the 101 verses in that book, this one in particular, speaks most to the role of the teacher, the student and the seeker. So as I was writing this part of my book, I dove deep into a swirl of my mother's energy for the first time in over 30 years. And I knew she'd be with me in some way as I wrote moving forward. And all of this gave me encouragement and peace on entering the author phase of my life. I'm already an author, I know. But the Deck of 1000 Spreads was more a product than a book to me. Books like the one I'm writing now are what I'm becoming an author to relate. Another thought has occurred to me over the past week, too. It involves why my mother waited so long to come to me. I was raised in a home that was about as free as you can get from religious or spiritual input. And yet look at me...a blogger with 1200 posts on spirituality and multiple books in progress. A discussion with my mother about that little red book would have been lovely. Her insights on her journey would mean everything to me. She died too soon for us to share this in real time. So maybe that was our unfinished business. I hadn't even realized how much that book of hers influenced me before I sat down to write about it. In fact, I've been realizing her influence a lot lately. I have zero doubt that if she were alive we would not only be kindred in our beliefs, but she would be my biggest fan in my efforts as an author. I'm feeling now that I am carrying a torch that she lit—a torch she couldn't carry for herself. And whether that's accurate or not, it is just the inspiration I've been looking for.